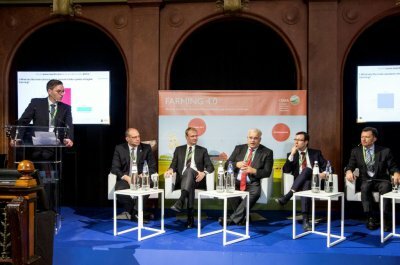 At the occasion of the CEMA Summit on Farming 4.0 held in Brussels on 12 October, the European contractors propose solutions to stimulate the adoption of new technologies in fields. However, despite the fast pace of innovation, all indicators show that the market uptake of such innovations in farming lags behind the swift adoption of digital technologies in other sectors. Many reasons can explain this slow uptake: cost of the technologies, limited infrastructure, lack of understanding of the benefits, compatibility of systems, education of the users… Though their positive impacts on both environment and profitability are not denied. In that context, "the risk-taking and innovative approach of agricultural contractors make them the right actors to foster the uptake of innovation in the fields" said Klaus Pentzlin, President of European agricultural contractors association. "Contractors are used to take risks, to assess what equipment is the best investment and make quick changes to new technology when improvements are real" he added. Precision farming is complex (from machines to information) and implies expensive investments. It means that there is a need to identify which business model is the most adapted. This is for farmers a real difficulty, for they do not have many opportunities to change their model. "Unfortunately, the European Commission and the Dutch governement are still focusing on subsidising farmers without asking the crucial question ‘is that really efficient’ ?" said Ton Van Eijck, an agricultural contractor from The Netherlands. "They don’t see yet the dissemination of precision farming thanks to contractors. Small farmers access that way technologies that they could not afford on their own, improving their efficiency and their profitability” he said. "There is a lot of uncertainties as regards European multiannual financial framework after 2020, and the Commission should focus on efficient spending rather than sticking to traditional recipes which are no longer matching the reality of the sector” added Klaus Pentzlin. However if digital technologies are improving farming businesses, they are raising a number of new questions… “With different brands in the shed, my employees and I would appreciate the manufacturers to agree on minimum standards on compatibility and software's structure, for an easier use and a more efficient service to our clients, the farmers" said Ton Van Eijck. Ensuring that rural areas getting connected and having access to broadband, clarifying the legal framework for the collection and use of data are urgent tasks for public authorities. It is essential to help the agricultural sector to take the full benefits of the digital evolution. Agricultural contractors, who are investing about €6 billion every year in Europe, will bring their positive contributions to make farming even more sustainable and profitable business.